In an emergency requiring shelter in place, the siren will sound as a 16 second "up" tone, followed by an eight second "down" tone cycling for four minutes. When you hear the alert tone, take shelter immediately! When the emergency has ended and shelter in place is no longer required, the siren will sound again to indicate an all clear. This tone will sound as a steady tone for three full minutes. An "all clear" will not be issued until conditions are deemed safe by emergency officials. Therefore, depending on the nature of the emergency, issuing an "all clear" could take several minutes or several hours. All campus community members should remain patient and sheltered until an "all clear" has been issued. The siren will sound a second time on a steady tone for three full minutes to signify an "all clear and emergency information sources will be updated." When the siren sounds, people within a 1.5 mile radius of each siren location (Schwartz Hall and DePaolo Hall) will be able to hear it. The siren will sound loudest closer to the actual siren locations and the sound will decrease as the distance increases from these locations. For a map of the siren coverage, please click here. UNCW installed two outdoor warning system on its main campus in July 2007. In August 2010 the university installed an additional 3 sirens to enhance the coverage. The system now consists of five strategically placed sirens that warn the university community to take shelter in a major emergency, such as a severe weather event. The siren will be sounded only during major emergencies when the majority of the UNCW community will need to shelter in place in order to stay safe. When a UNCW community member hears the siren, he/she should take shelter indoors immediately, seek information from a variety of sources such as the UNCW main website or the emergency hotline at 910-962-3991 (information will be posted as soon as it is available), and wait for an "all clear" siren or message. Why have a siren on campus? UNCW has seen the need for an instant notification system for the campus that can alert the campus community of major emergencies. 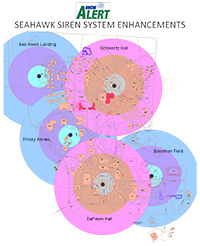 A siren system serves the purpose of notifying the UNCW community who are outdoors instantly if a major emergency is occurring on campus. While fire alarms can notify building occupants to immediately evacuate a space, the siren system allows for a method of notifying students, faculty, staff, and visitors who are outdoors that a major emergency is taking place and to seek shelter to stay safe. The Seahawk Warning Siren System is meant to be an outdoor emergency warning system that is used to warn people of the need to take shelter indoors. People who are outdoors on the UNCW campus will be able to hear the sirens. Additionally, the siren will penetrate many buildings on campus so individuals inside may also hear the siren however, the siren system is primarily intended to be an outdoor warning tool. Because the siren is an outdoor warning system, it may not penetrate all buildings on campus. In these buildings, alternate notification methods will be used to alert the occupants of an emergency. When the sirens sound, everyone on the UNCW main campus should take shelter indoors immediately. Close all windows and doors, if possible, and remain sheltered until an "all clear" is given. When the siren sounds, university officials will post information about the emergency as soon as possible. However, depending on the nature of the emergency, it may take several minutes for information to become available. For this reason, it is important that campus community members remain sheltered until an "all clear" has been issued. Call the Emergency Information Hotline at (910)962-3991 or toll free at (888)657-5751. Click on the "Emergency & Safety" link or the "News" headline. Check e-mail for an emergency e-mail notification. Neighbors in the surrounding area of UNCW's main campus will be able to hear the siren when it is activated. In this case, neighbors should seek information in the same way UNCW community members will (i.e. by checking the UNCW homepage, calling the Emergency Information Hotline, etc.). The siren will warn surrounding neighbors of immediate hazards requiring shelter in place just as it will warn the UNCW community. Neighbors should take shelter as well, because an emergency requiring siren activation will likely not only affect the main campus, but also the surrounding areas. Neighbors will be notified about the full volume siren tests through various means by the Office of University Relations and others. If you are a neighbor to UNCW and would like to be added to the siren notification e-mail list, or if you have concerns about the siren system, please e-mail the UNCW Emergency Manager, Eric Griffin. UNCW's sirens are Tempest 121 Mechanical Sirens purchased from the American Signal Corporation. There are eight horns on each siren and when activated, each siren will produce a sound of 121 decibels at the ground level of the siren. The sirens are designed to achieve a minimum of 70 decibels of sound throughout the entire campus. The sirens run on 48 volt DC batteries that are continuously charged. If power is lost to the sirens, they are still capable of sounding if activated. For example, if power is lost to the campus for 10 days, the siren is still capable of running a 15 minute cycle. Further, the siren system is supervised by a compulert software system that notifies UNCW Police and Emergency Management when power is lost or when the siren control panel is opened. When activated, both sirens will sound simultaneously. There are five sirens located on UNCW's main campus. Sirens are located on the roof of Schwartz Hall (a residence hall), the roof of DePaolo Hall (which houses Student Health and other student services), Sea Hawk Landing (edge of back parking lot); beside Friday Annex and at Boseman Field. UNCW Police will activate the siren from the UNCW Police Dispatch Center located in the UNCW Police building on UNCW's main campus. The UNCW Police dispatcher located in the New Hanover County Emergency Communications Center can also activate the siren if necessary. UNCW Police will activate the siren only in major emergencies affecting the campus that require UNCW community members to seek immediate shelter for their safety. Example incidents in which the siren could be activated include (but are not limited to) a tornado warning or sighting in New Hanover County, a major hazardous materials spill on or near the main campus, or an active shooter on campus. In order to maintain the siren and ensure it is in working order, it must be tested on a regular basis. The UNCW siren system will undergo a full test on the second or third Monday in January, July, and September at noon. A full test involves the activation of the sirens' alert and all clear sound at full volume. The UNCW community, as well as surrounding neighbors, will be able to hear the siren when it is tested at these times. These tests will be publicized in advance to both the UNCW community and to surrounding neighbors. During a "growl test," the siren is sounded at a very low burst to ensure it is in working order. Occupants of Schwartz Hall and DePaolo Hall, as well as people in the immediate vicinity of the sirens, may hear the growl tests. These tests will be announced prior to their being held. A UNCWAlert system activation will not occur for these "growl tests."